As kids, volunteering to wash the cars was a great way to get cool. Still works when you’re grown up too. 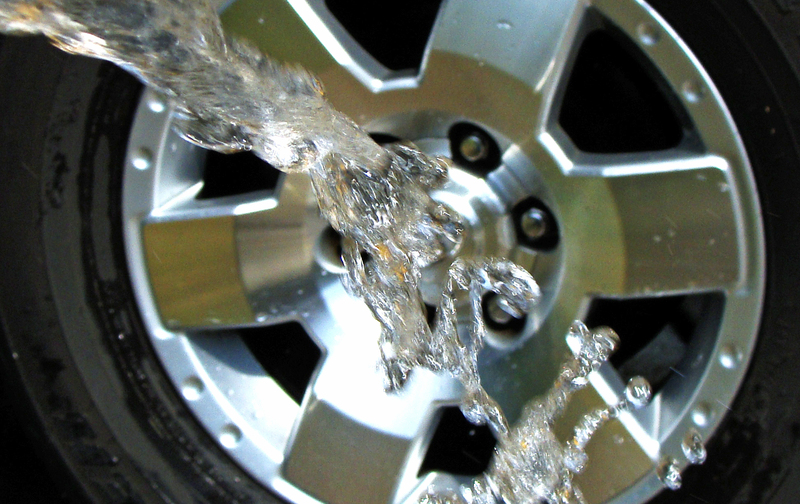 LET IT FLOW — Getting rid of the brake dust while staving off the 90-plus degree temperatures. 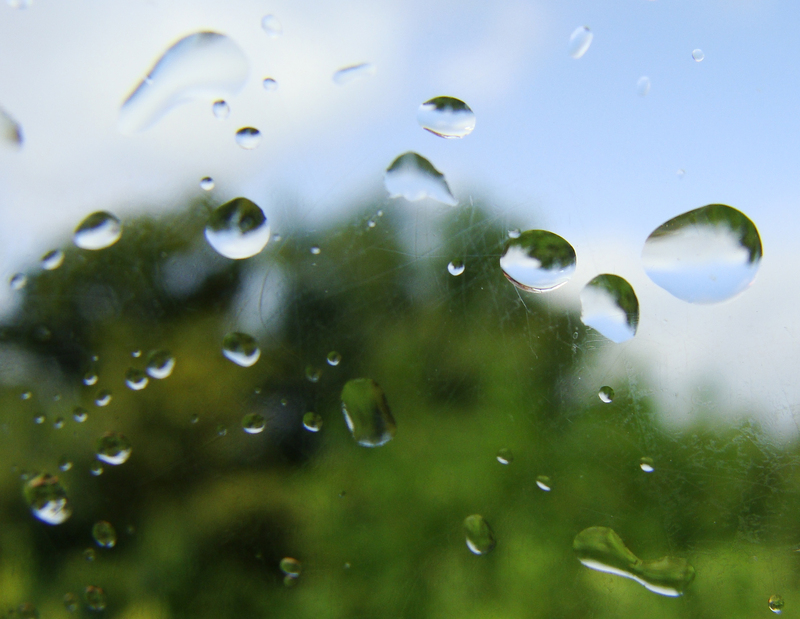 Visit the parent page for this week’s photo challenge and other visions of summer. An indigo bunting continues its rat-a-tat-tat on our windows, even after mama cardinal halted her attacks now that her baby is almost independent. When it comes to church music, I have to confess to a certain curmudgeonry about hymns written after, say, 1900. Nothing against 20th and 21st century composers*, but for me there is a certain dignity, comfort and reverence found in older hymns such as “Holy, Holy, Holy,” especially when played on the kind of pipe organ whose thunder resonates in your chest like the roar of a rocket launch. Today’s celebration of Pentecost opened with a hymn that made both the curmudgeon and the medievalist in me do cartwheels (liturgically correct inner cartwheels, of course): “Come Holy Ghost.” Here is a hymn whose lyrics are attributed to Rabanus Maurus, a Benedictine monk of the late 8th and early 9th centuries. Rabanus belonged to what’s called the Carolingian Renaissance, one of the brief moments of illumination in the darkness that swallowed post-Roman Europe. A teacher, poet and scholar, Rabanus was among those who helped pass on another spirit: the spirit of learning. For more about Pentecost and what it means to those on the journey of faith, read Father Jason Smith’s post. 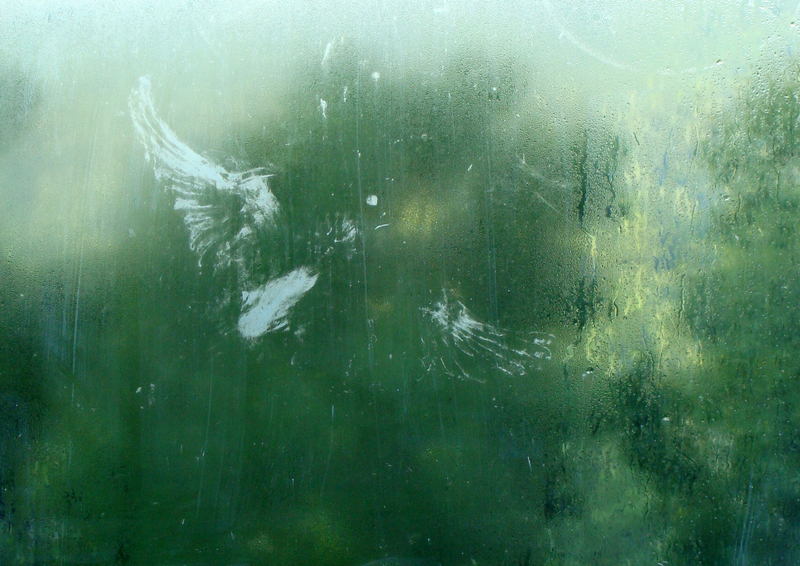 GHOST BIRD — This impression left on the living room window by a bird always reminded me of the imagry of the Holy Ghost as a dove. *I like Ricky Manolo and Marty Haugen as much as anyone, but when one of the “old time” hymns comes up during Mass, those are the ones that engage the most voices among the congregation. Nearly every branch is in motion with the landings and departures of hundreds, if not thousands, of honeybees, carpenter bees, bumbles, wasps, butterflies and hummingbirds. Its shiny black fruits keep the birds happy through the winter. 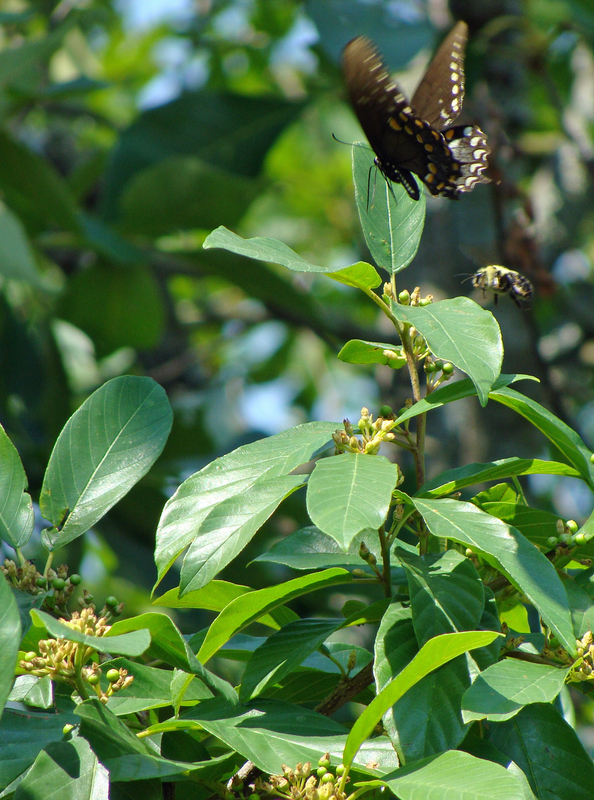 YOU’RE IN MY AIRSPACE — Bumble bee and black swallowtail vie for the same spot on this blooming tree. Nothing like simultaneous approaches on intersecting runways. 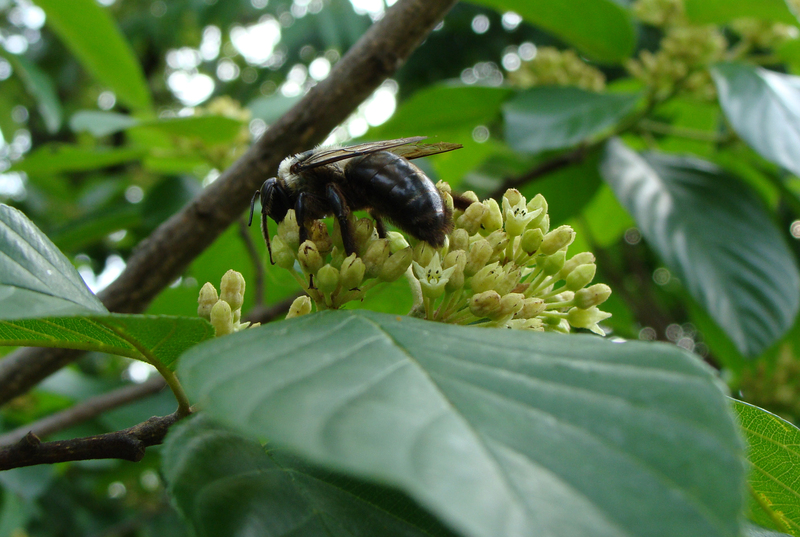 CARPENTER BEE — Big carpenter bee in the blossoms. Summer? Sandy Hook. Wildwood. Monmouth Park. Mungo Jerry. “Close to You.” Water pistols and nickel punks. Bikes with baseball cards flap-growling in the spokes. 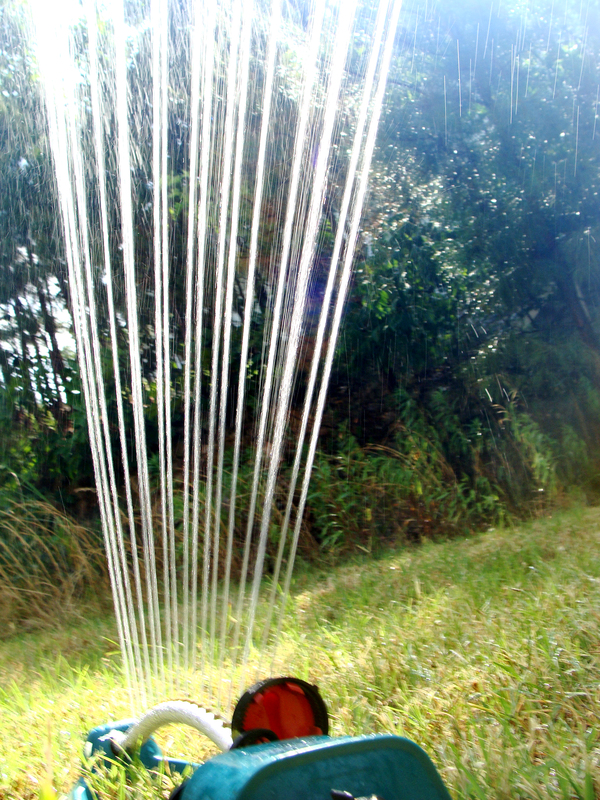 And when it got really hot, we begged Dad (the man in charge of all things lawn-related) to deploy that ultimate weapon against the July heat: the sprinkler. SPRINKLER — It just wasn’t summer without the oscillating sprinkler on the front lawn and a trio of giggly girlfriends running and jumping through its streams. DROPS — What summer fun looked like if you wore glasses. THANKS to everyone who has liked our blog! Thanks for taking time to stop by. Nothing like breakfast in the morning air. Caught these three having a morning meal before we headed to work. 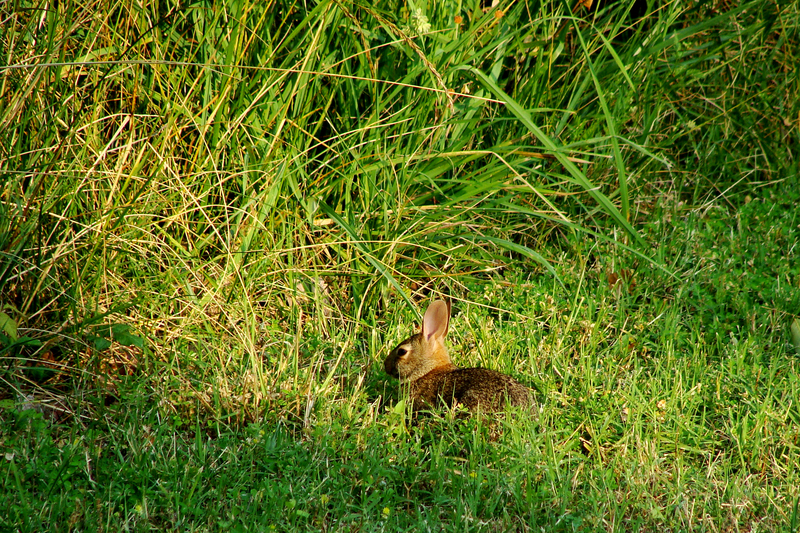 MORNING BUN — Wild bunny enjoys breakfast in the grass. 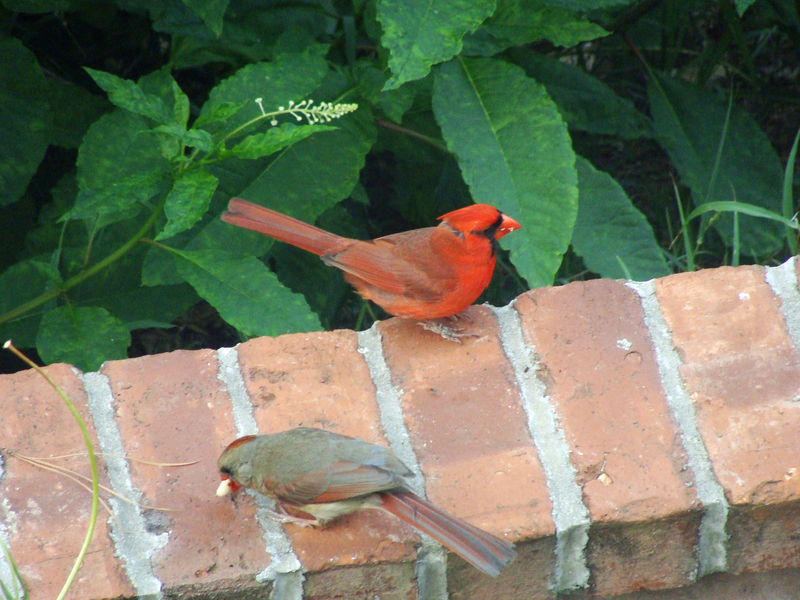 FAMILY BREAKFAST — The humpbacked cardinal stands watch while baby bird grabs a bite. 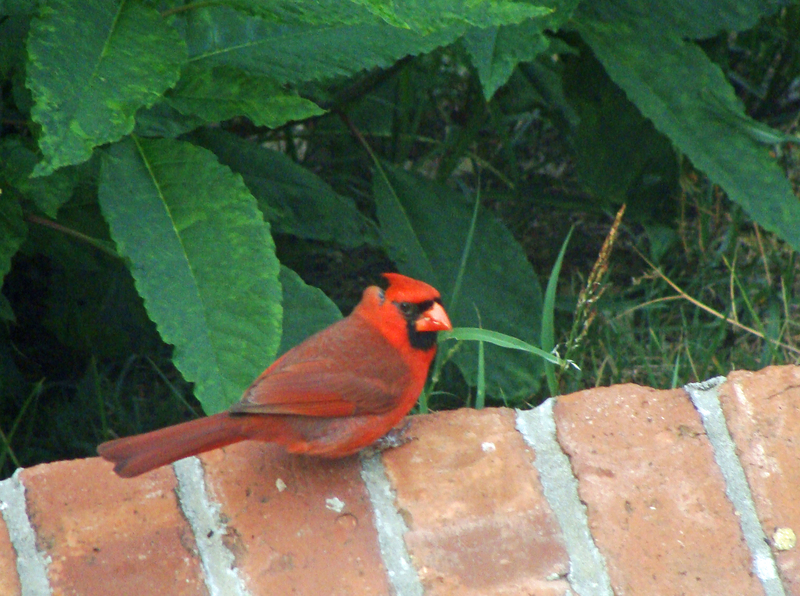 HUMPBACKED CARDINAL — The bump on the humpbacked cardinal shows clearly in this shot. Whatever the growth or wound is, it hasn’t slowed him. Hey! This is post No. 400! Hooray! Sunday was a day for unusual long-tailed fowl. Why can’t we get the Roadrunner theme song out of our heads? 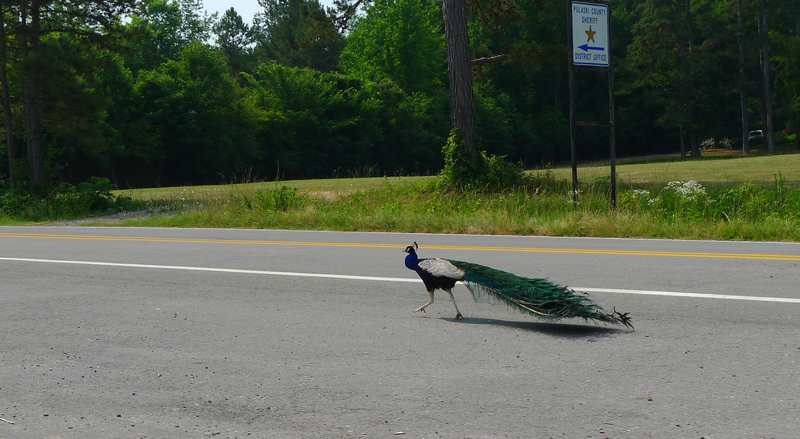 ROAD RUNNER — No coyote in sight as the Ferndale peacock runs along the county road near the sheriff’s substation on Sunday morning. 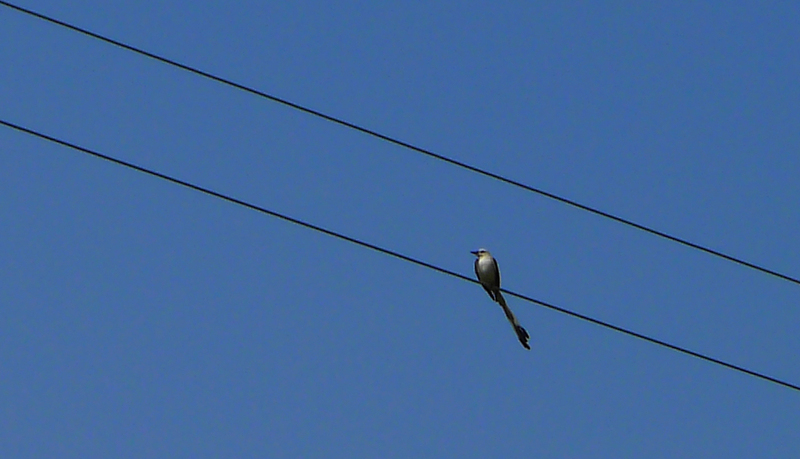 LONG TAIL — We think this is a scissortail flycatcher. If so, he is east of his usual range in western Arkansas, Texas, Oklahoma and parts of Missouri. This bird was riding a wire near Grider Field in Pine Bluff. Sometimes, beauty is skin deep. 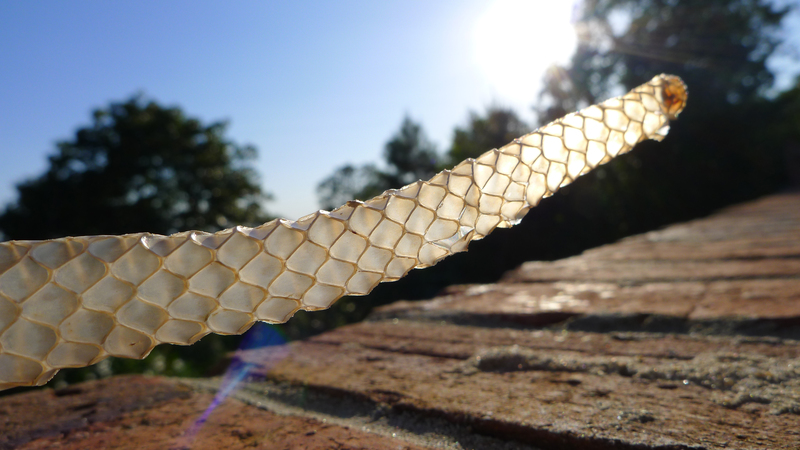 Our under-the-porch friend left a present for us — a long, robust snake skin in two parts. The final few inches that included the head scales was still stuck in the entrance to his lair. Decided not to stick my hand in to retrieve it. 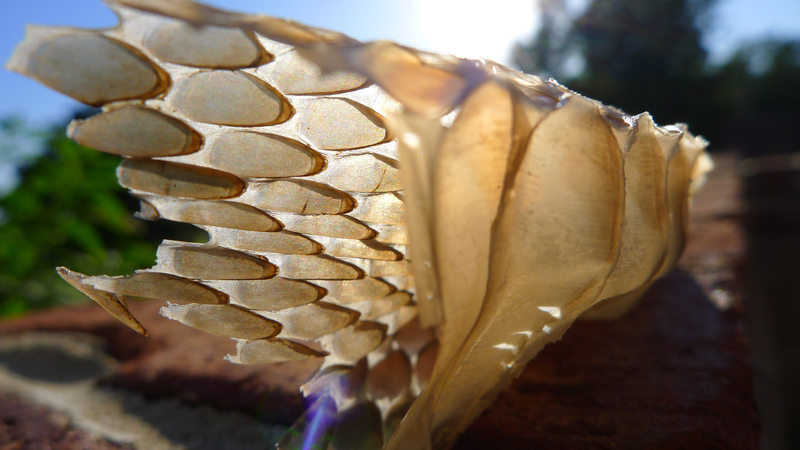 INSIGHT — Head end of the skin left by an Eastern coachwhip. 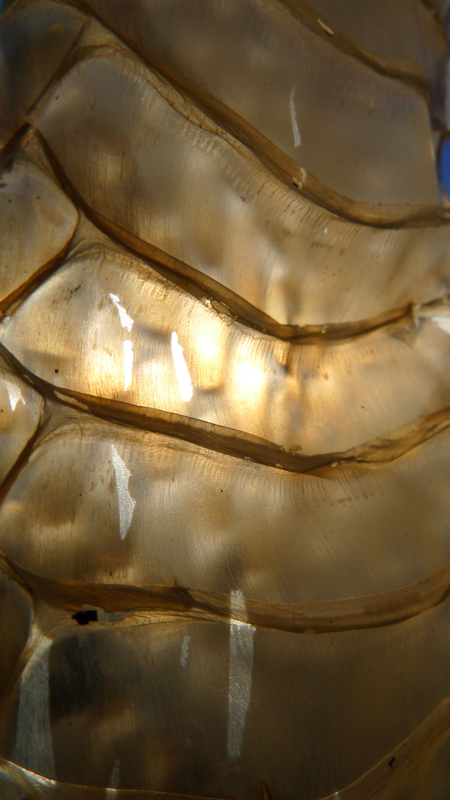 FRONT TO BACK — Sunlight filters through to the belly scales. TAIL LIGHT — The end of the line. 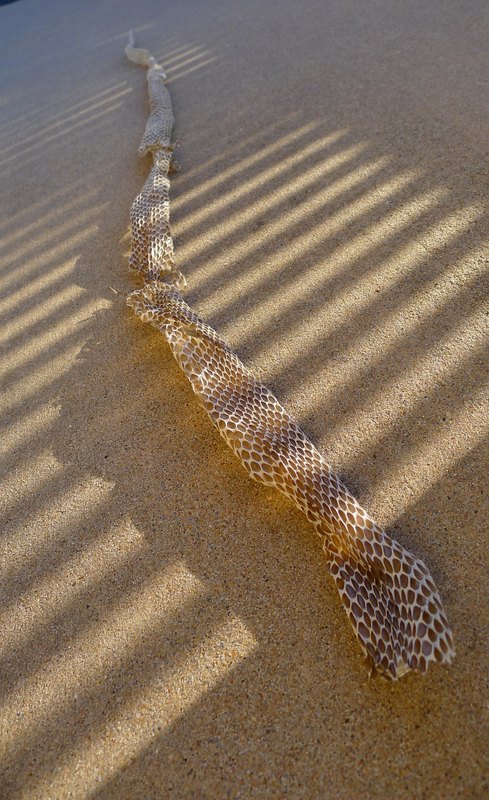 LONG WAYS — The snakeskin stretched out was about 4 feet long. After nearly seven years living in southeastern Florida, certain things become habit. One is looking for alligators in every body of water larger than a puddle. The second is gaining an intimate knowledge of hurricanes: how they form, where they go and most importantly, how to survive one. Those seven years included the apocalyptic 2005 season where there were so many storms, the National Hurricane Center ran out of names and had to resort to Greek letters. By the time Epsilon and Zeta (storms No. 27 and 28) showed up on the NHC maps, most Florida residents could only shake their heads or laugh in that giddy sort of punch-drunk way, then check to be sure they had sufficient batteries, toilet paper, water and bleach. Even now, the National Hurricane Center remains bookmarked in our browsers. You’d think that in landlocked Arkansas, this old obsession with tropical weather would wane. After all, Arkansas hadn’t seen the sea since before the Ouachitas were formed. 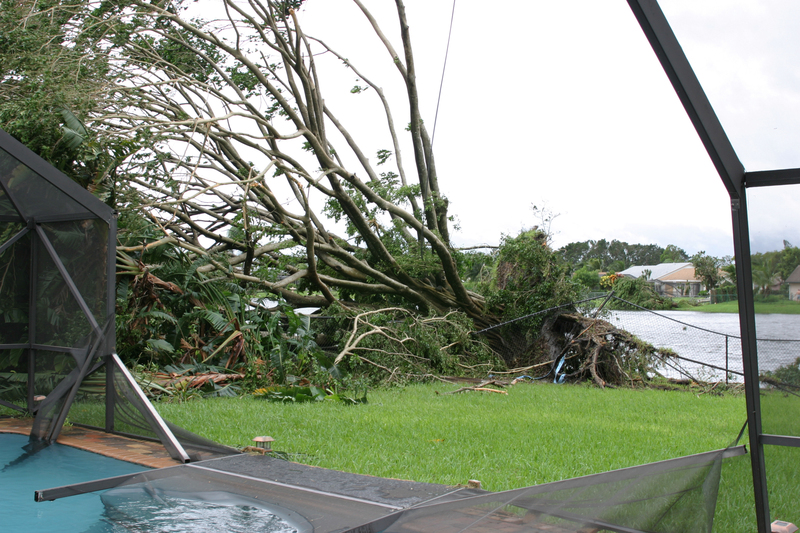 However, in 2008, Ike still packed enough of a punch to knock the chimney off our house and Gustav followed, damaging crops and causing other expensive vandalism inland. Hurricanes and tropical storms are never to be taken lightly. 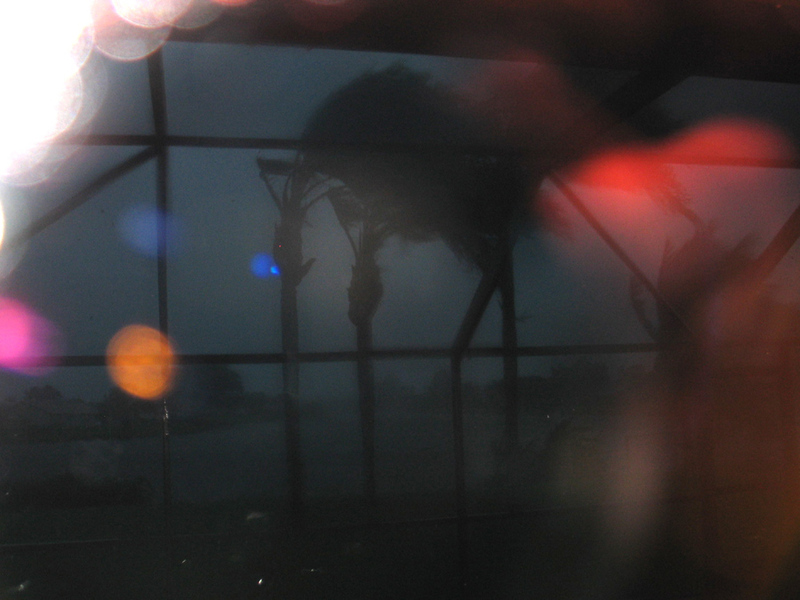 HURRICANE WILMA — So dark. So intense: Wilma comes ashore. The 2005 hurricane was most intense storm ever to develop in the Atlantic. The storm vibrated the glass in the sliding door so fiercely, it deflecting the plate about a sixteenth of an inch. WiLMA — After the eye passed, the winds shift direction, but not intensity. The palm trees lean and blow in the opposite direction. 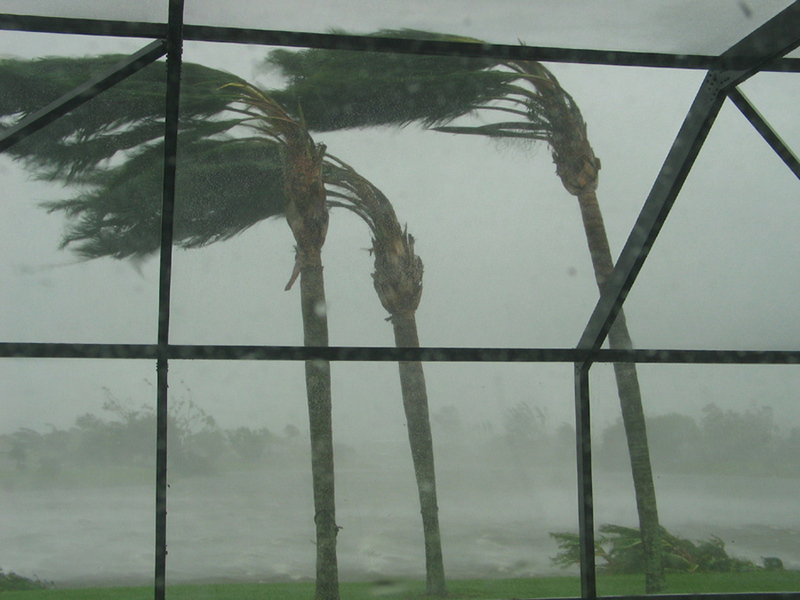 AFTER FRANCES — 2004’s Hurricane Frances did her share of damage. This slow-moving storm made us feel as if we were sitting next to a jet engine for nearly 36 hours. The roar was punctuated by the ping of objects bouncing off the house, the slow creaking of wind-tugged roof joists and the sounds of shearing metal. This is what we saw when the storm finally passed. And we were among the lucky ones. 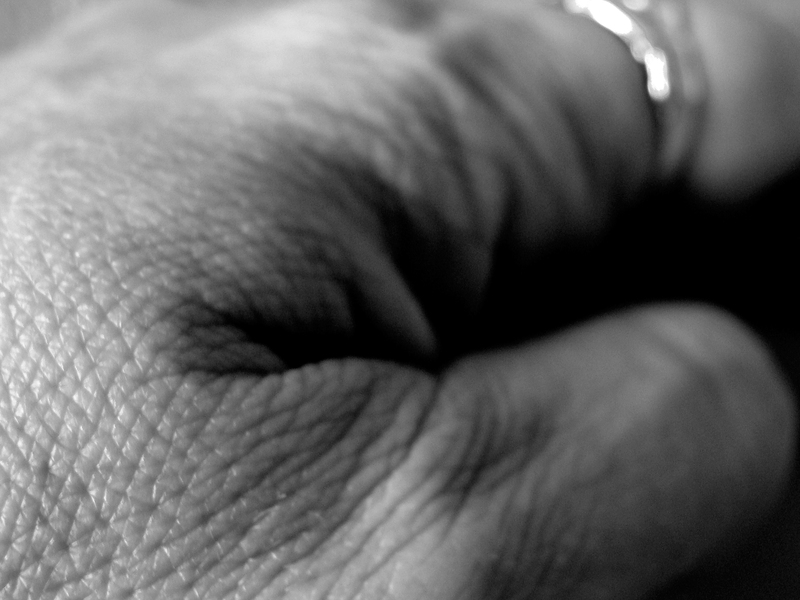 Hands can tell as much about a person as his or her face. MARKS OF TIME — Time shows in some of the hardest working places. 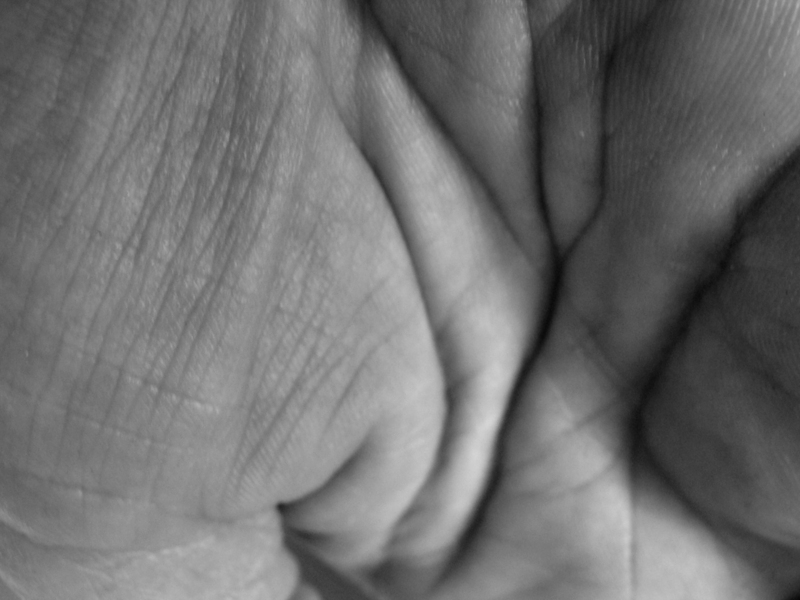 INSIDE — The folds of a palm.